Does anyone own or have experience with the above awning? I am looking to establish the feasibility of one of them. African Outback supplies (and makes?) them. Almost double the price of normal awnings, but it does look like a damn impressive bit of kit. Talk softly, carry a big stick. A blatant copy of the Oz tent foxwing... And might I add a significant improvement... no poles or pegs... so how expensive? I had one fitted. On the day of the installation, they where suppose to fit the fox wing, but they called me to come and have a look at the ostrich wing. The decision was easy to make, there is a big difference between the build quality of the two products and the price difference was small. Awesome tree in the middle of the Namib dunes. Th, could you post some pictures of how it is mounted. What are your impressions of how sturdy it is? That is alot of sail area and i am worried that a gust of wind could take it off the vehicle. Good question - there's an awful lot of area and leverage working on that pivot point, not to mention on the roofrack attachment. I hope it's very well engineered, or there will be a nasty surprise if the wind picks up. "Two roads diverged in a wood, and I.....I took the one less travelled by, And that has made all the difference." Please the attached photo for the shade area. I do not have photos of the mounting brackets, but in short there are three mounting brackets, one just over half way to the front of the vehicle and two close to each other at the back of the awning. The hinge at the back of the awning is between 150mm to 200mm and the bracket that the hinge is mounted on is made out of 5mm thick sheet metal. It is definitely strong and when mounted to the roof rack it is not going anywhere, I used it as a handle to climb up on top of the roof rack. Do forget that each arm has a ring at the end that can be used to tie a rope to and pen it down to the ground and when the awning is not going anywhere. Thanks for posting the picture, TH. It looks very convenient without all the poles and ropes normally utilised by awnings. May well be worth considering. That was my first thought as well. The price of the Foxwing quoted by 4X4MW was R6000. TH says the price difference was small, so I assume it also costs around R6000. TH's pic shows the shade cast by the awning far better than the 4X4MW(?) picture does. 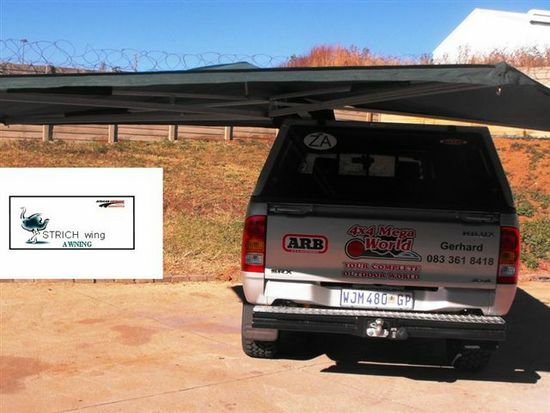 Notice that the 4X4MW pic shows the awning on a bakkie. I don't know if that is a DC, bt the guy at 4X4MW gave me a long lecture as to why the Foxwing will not work on a DC bakkie - the bakkie cab or canopy too short, too much movement between cab/canopy etc. Will the Ostrich work on a DC bakkie ? At R6000 a shot, I think my lathe, milling machine and TIG welder are going to be getting a workout. It can't be that difficult to fabricate one, as long as your basic engineering principles are adhered to. I'll do the metalwork, and my parachute rigger will be tasked to sort the fabric out. Something else added to my long list of 'things to do'! I had mine fitted to the roofrack last week. Very impressive and very quick to set up and fold away. I had a look at awnings over the past few months and this one is, in my mind, better than everything I saw up to now. My criteria is balanced between quality and ease of operation. Note it is an L-shape with the awning pivot base on the left back corner of the roofrack. One of the 4 "balke" opens up 270 degrees. For this one we made an anchor point on the back right-hand corner of the roofrack. To me this helps a lot to further anchor the awning. Then you're left with only 3 tent pens and ropes if the wind is really a problem. For this one we made an anchor point on the back right-hand corner of the roofrack. To me this helps a lot to further anchor the awning. Then you're left with only 3 tent pens and ropes if the wind is really a problem. I was thinking the same Makes the whole structure alot sturdier and eliminates the bending moment where it attaches to the roof rack. What is the possiblity to fit this Ostrich Wing Awning on a Echo 4 trailor? Then I dont need to take a kitchen Awning. I saw an Echo Chobe standing at Tent Clinic in Parow (Cape Town) last week with a Foxwing (Same as Ostrich wing) mounted onto it. The owner or somebody added some brackets to the side of the Echo to mount the Foxwing. Phone Vincent on 021-9329327 and maybe he can take a photo for you. Thanks Saskia I will do homework because this fox wing is a great great invention for outdoor use. just had to wake an old thread..
can one fit sides to an ostrich wing? would be nice to have a ''tent'' attached stright to the vehicle that can be stowed quickly. I bought one shortly after they were lauched and it has been mounted onto the roofrack of my Hilux for the past two and a half years. It works like a charm . In summer if I am to lazy to pitch tent at Rust de winter after a day on the water , I simply attach a mozzie net to the wing push my strethcher under it and sleep like a baby. I have only had to attach guy ropes once when the wind was really howling. Vehicle awning: What size to be of any use?